The Board of the association consists of seven mouth and foot painting artists, including the President and the Vice President. These must be full members of the Association. A Legal Adviser is a member of the Board too. At the General Assembly in Vienna in 2013 Dr. Johannes Gasser was elected by the members as the Legal Adviser. Serge Maudet’s hands and legs have been paralysed since birth. Already as a child his mother taught him to use his mouth and to hold a pencil between his teeth. “I was born with a brush between my teeth. Painting was my first means of expressing myself. As a child I painted the things that I could not do and that became the tool for expressing my feelings”, says the mouth painting artist. At the age of 17 he decided to take a correspondence course in accounting. However, he soon realised that he was not suited to that kind of work. He decided to dedicate himself fully to drawing. At the age of 22 he received a scholarship from the Association. In 1983 he became a Full Member of the VDMFK. 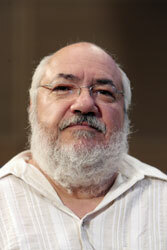 In October 2002 he was elected member of the board on the occasion of the general meeting in Lisbon. In July 2013, on the occasion of the General Meeting in Vienna, the members elected him to the President’s Office of the Association of Mouth and Foot Painting Artists of the World. Serge Maudet took private classes with a professor in Paris. As a landscape painter the artist follows the tradition of the French impressionists. In many paintings and some details the artist’s personal pictorial philosophy of life becomes evident. Every year Serge Maudet takes part in numerous exhibitions. In addition, every year he teaches various courses, aimed at those people who want to embark on the adventure of painting. Serge Maudet’s great success with his works and his courses have made the media report repeatedly about the mouth painting artist. At the age of 11 Ruth Christensen lost both arms up to the elbow in an accident. In her youth she attended the arts and crafts school in Copenhagen. She then worked in an advertising agency as a gra-phic artist for a number of years. Back then she had already found her own style in floral and Nordic Christmas motifs. She designed a Christmas welfare stamp for the Royal Danish Post and a Christmas card for the European Council in Stras-bourg in 1992. 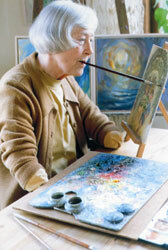 Aside from her job as a graphic artist, Ruth Christensen began mouth painting with an ambitious artistic language. Her colorful and expressive floral pieces, still lifes and landscapes are her preferred subjects. She also likes to ex-press the refraction of water. In doing so, she uses glasses filled with water which optically refracts branches and flower. She also enjoys painting children, animals and the Christmas spirit in various techniques. She generally paints with watercolors or oil paints. Thanks to her numerous works, she has already been able to participate in numerous exhibitions. Ruth Christensen has been a member of the association since 1982. In 1992 she was elected to the board of the VDMFK which she is still a part of today. The connection and friendship with mouth and foot painting artists from around the world are her hobbies. She keeps in close contact particularly with her colleagues in the Scandinavian countries. Kun-Shan Hsieh grew up in poverty and had to support himself by working in a factory after leaving primary school. At the age of 16 he suffered a very serious electric shock in a work accident. The consequences of this were so severe that both hands and his lower right leg had to be amputated and he lost the sight of his right eye. 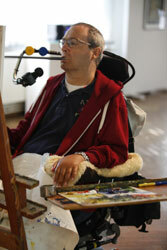 Faced with these disabilities he taught himself to sketch and draw using his mouth over a period of seven years. In 1980 he learned the techniques of painting with a renowned Taiwanese painter. In 1990 he became a full member of the association. 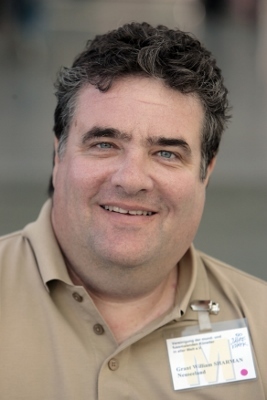 Since 2002 he has been a member of the VDMFK managing board. His work has been influenced both by the impressionists and by the traditions of the Far East. His oil paintings are characterised by their rich variations in shade and colour and bear impressive testimony to his character that is both optimistic and full of humour. Kun-Shan Hsieh’s favourite subjects include landscapes, still lifes and animals. A particular love of his are painted snapshots capturing the motions of an indolently swimming river carp. In experimenting with the possibilities for painting in large format he produced a work with the title “Golden Pond” in a 259 x 182 cm format over a period of one year. This work won the American visual arts prize of the “Association for Especially Talented Artists” in 1997. Kun-Shan Hsieh wrote his autobiography with the title “I am Kun-Shan Hsieh” in 2002. The book has been a great success in Taiwan and has been translated into several languages. Tom E. Yendell was a thalidomide baby, born without arms. For this reason, he has used his mouth, feet and chin for the activities of everyday life from childhood onwards. Following basic schooling, he attended and graduated from the Brighton College of Art. In 1986, he was given a scholarship by the Association. Having become an Associate Member of the VDMFK in 1993, he became a Full Member in 1996. In July 2013, on the occasion of the General Meeting in Vienna, he was elected member of the board. Tom E. Yendell’s graphic works display a high degree of perfection. He likes to paint in powerful colours and with powerful brush strokes. His inspiration comes mainly from nature. One of the specialities of this mouth and foot painting artist are strict ornamental and graphically effective Christmas motifs. He has presented his works to the public at a number of exhibitions. Tom E. Yendell is also committed to helping the disabled. Even during his studies, he organised an art seminar attended by 150 disabled persons. This was followed by further public relations work, championing the cause of the disabled in the press, the radio and on television. In addition, each year he holds a number of public lectures about himself and the work of the Association, which meet with an excellent response. Thomas Kahlau attended polytechnical high school until he suffered paraplegia as the result of a swimming accident in 1976, which left him completely paralysed. From 1978 onwards he began to learn to perform many tasks with his mouth, including his first attempts at painting. He received lessons in a number of school subjects at home in 1978 and 1979. Following this he attended a painting and drawing course with a painter and art teacher for one year. He received a scholarship from the Association in 1986 and since then has worked intensively on his artistic development. He was accepted as an Associate Member of the VDMFK in 1992 and only three years later became a Full Member. In July 2013, he was elected member of the board on the occasion of the General Meeting in Vienna. The landscapes of his native Brandenburg are among the preferred subjects in the work of Thomas Kahlau. 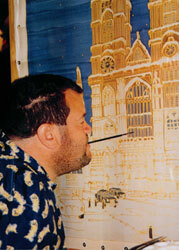 Buildings and figures are also included in his oil, watercolour and acrylic colour paintings. His work, which is generally highly expressive in character has been exhibited in numerous solo presentations throughout Germany, but he has also participated in international exhibitions. Thomas Kahlau has frequently achieved notable successes with his art. A highlight in his career as an artist was the award of the prestigious German Distinguished Service Cross by the German President on 10 October 2000. This high award was in recognition of his artistic achievements and his social commitment. Thomas Kahlau also has literary work to his credit: he has told the story of his life in a book entitled “Die Kraft in mir” (“The Strength in Me”). 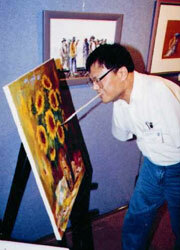 At the age of two, Soon Yi Oh lost both arms in a tragic accident. As a result she had to spend many years in the hospital. At the age of five she learned to perform everyday tasks with her feet. She attended primary and secondary school. In her fourth year at secondary school her teacher encouraged her to paint by holding a brush between her toes. Foot painting soon became her hobby and still is today. In 1985 Soon Yi Oh for the first time showed her paintings at an exhibition in Taiwan. In the same year the footpainter was admitted to the Korea High School Art Competition. Only one year later she began to study at university and later graduated in drawing. 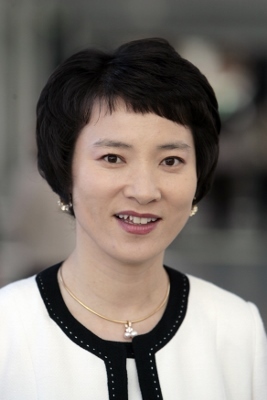 In 1987 the Association granted her a scholarship. In the early 90s she enrolled in a two-year art course. She became full member of the VDMFK in 1992. Soon Yi Oh mainly paints landscapes in oils. She has shown her works at several exhibitions. At the age of 15 Grant William Sharman broke his neck during a rugby match, which left him quadriplegic. He had to give up his dream of becoming a pilot. During his stay in hospital he worked as a receptionist for a wallpaper manufacturer for seven years and after leaving hospital he was employed by the Auckland Area Health Board as a patient advocate and councillor. In 1980 Grant William Sharman was introduced to painting with a brush in the mouth by the mouth painter Bruce Hopkins, a member of the VDMFK who died in 1985. The training bore fruit, and it was only one year later that Sharman was granted a scholarship by the Association. As early as seven years later he became a full member of the VDMFK. Grant William Sharman’s favourite motifs are flowers and landscapes. His paintings are characterised by a deep feeling for nature and great artistic instinct. He has displayed his work at competitions and exhibitions all over New Zealand as well as abroad and has received numerous awards and distinctions. It is therefore hardly surprising that the media have done a story about him several times. In 1991 he organized and staged his first solo exhibition. In addition, he regularly conducts workshops and speaks at schools and different organizations about living in a wheelchair and the ups and downs of life with a disability.